Okay, I'll admit it. Sometimes I search on Etsy specifically for items that are book or library themed. Yup, that's how cool I really am! But sometimes it pays off - seriously. 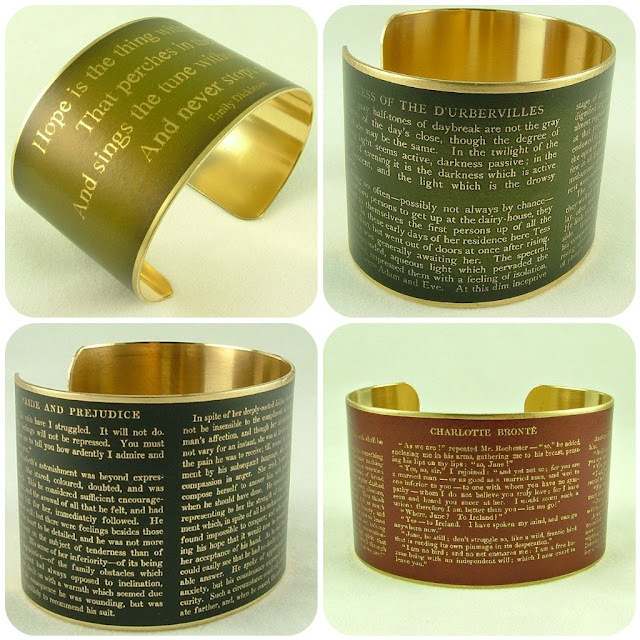 For instance, I recently stumbled upon these literature embossed cuffs from Jezebel Charms. If you can't already tell whey I love them, I'll tell you. Firstly, they actually look really great and I can easily picture incorporating them into my outfits. Secondly, almost every literary work I love from Austen to Shakespeare to the Brontë sisters and then some are available in the shop, so the fancy of my former English major self is definitely tickled. And last, but certainly not least, every librarian needs at least one (but preferably more) book-themed accessories. Right? Okay maybe not, but this one definitely does. Needless to say, these word-wrapped cuffs have wormed their way right onto my ever-growing Etsy wishlist, and hopefully sooner rather than later at least one of these will be found warming my wrist with their inspiring words. ok, these are totally gorgeous. ...if you want we can follow each others!? Very cool! This kind of reminds me of the Barber's Daughter jewellery that I love and have eyed at a local gallery for a long time! These are so cool! I would definitely where one of those cuffs. Wow, great find, they are so lovely! I just recently blogged about my Etsy addiction, so I am feelin' this post! what a unique and lovely idea! i think i might have to head to her shop! WOW. These would make great gifts, very unique.